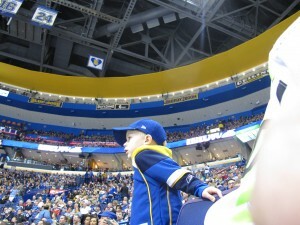 I love being in a hockey city, and St. Louis is a hockey city. 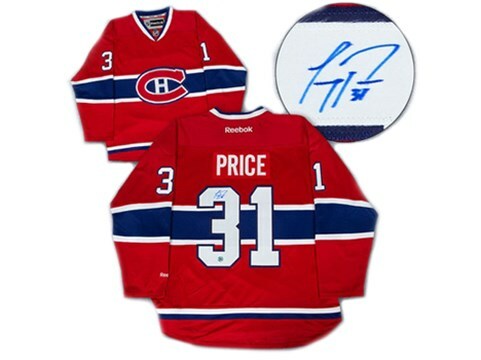 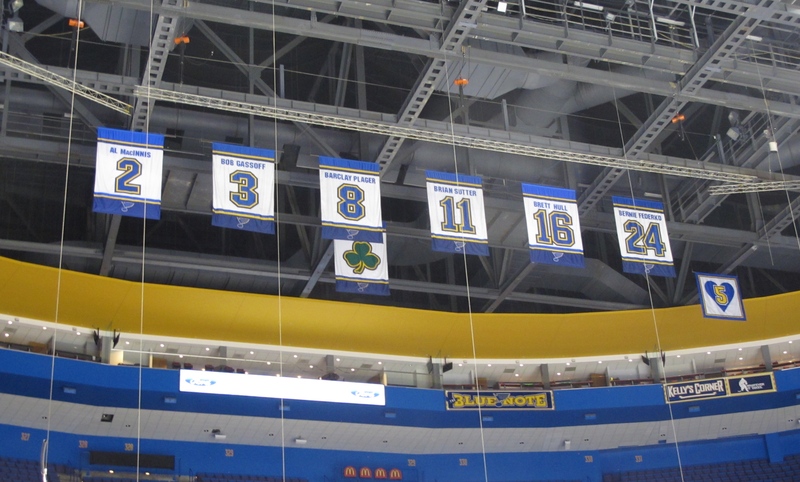 They were part of a group of six expansion teams joining the “original six” teams for the 1967-1968 season, so they’ve been in the NHL for almost 50 years. 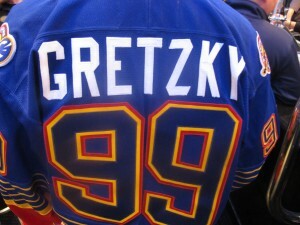 The St. Louis Blues have never won the Stanley Cup, but they have been a strong contender the last number of years. I’m predicting they will go a long way in the playoffs this season. 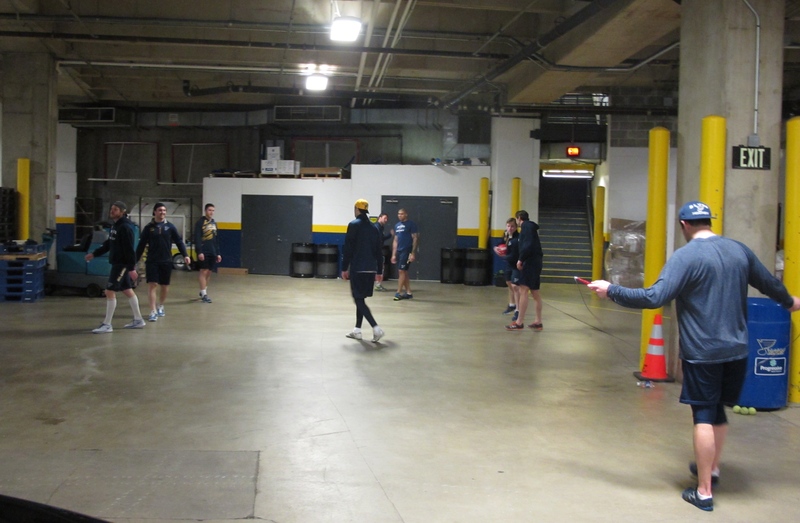 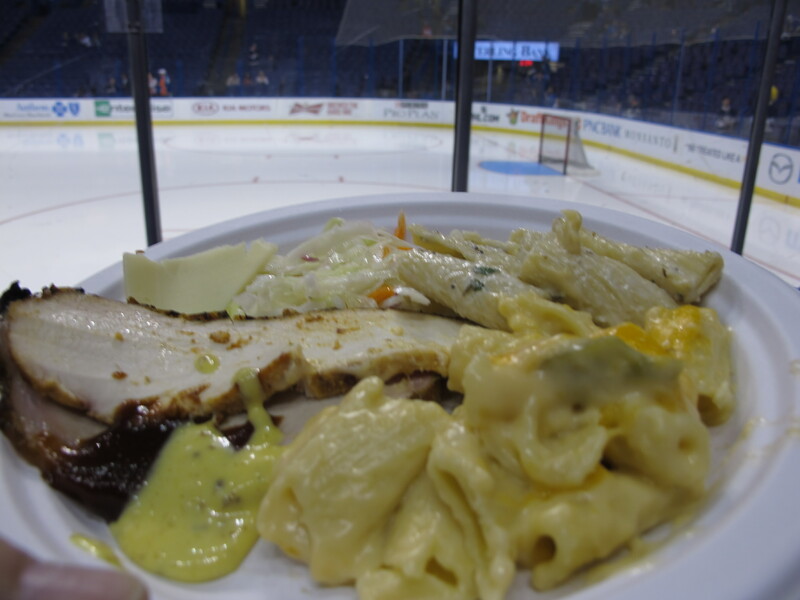 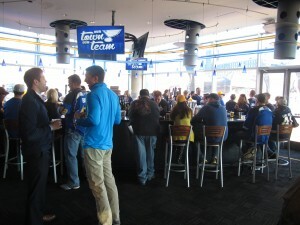 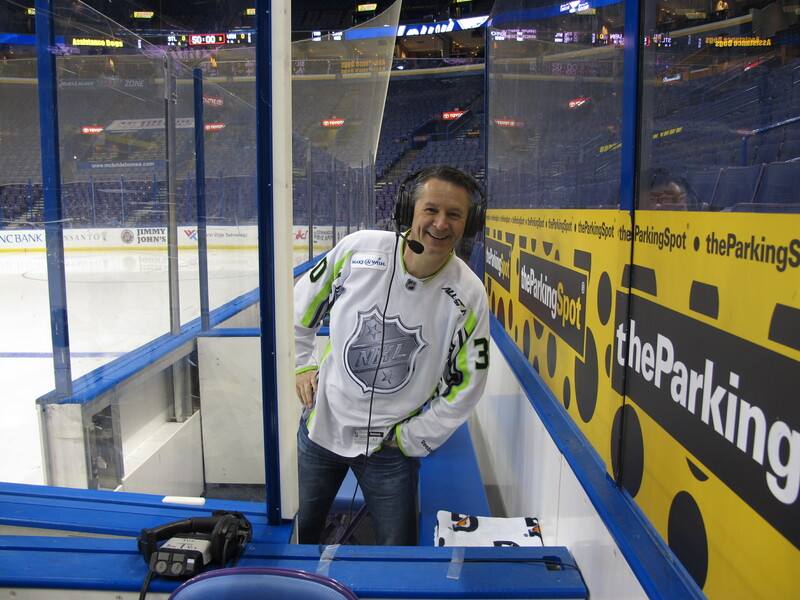 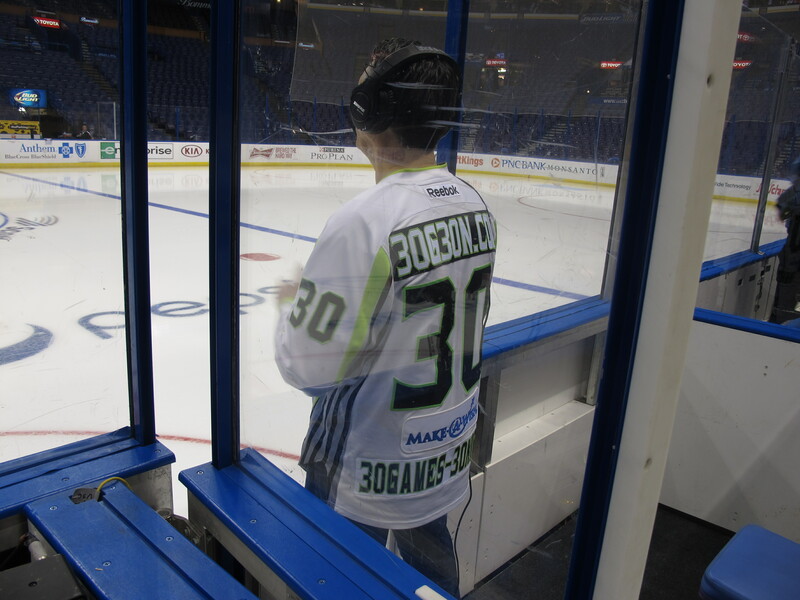 I met up with Phil Forsman from the Blues PR department before the game, and he gave me a tour of the building, and similar to my experience in TB, I was able to watch the players warm up before the game. 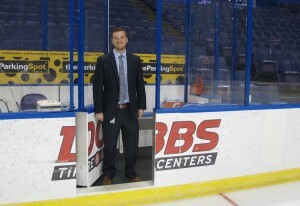 Thereafter I was taken to the penalty box (and just like the players, I didn’t agree with the call), for an interview with NHL.com. 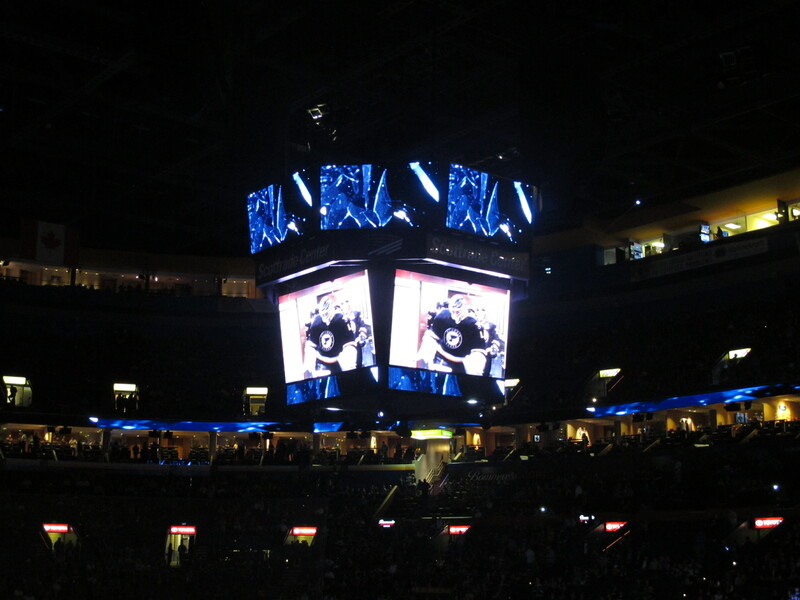 They actually have a camera situated at the bottom of every arena’s jumbotron to conduct interviews, etc. 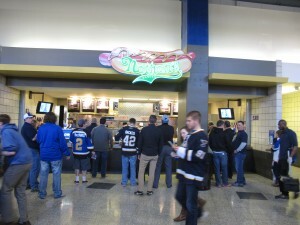 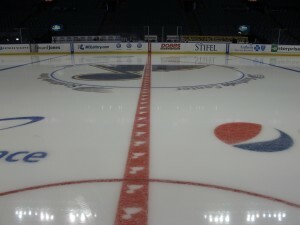 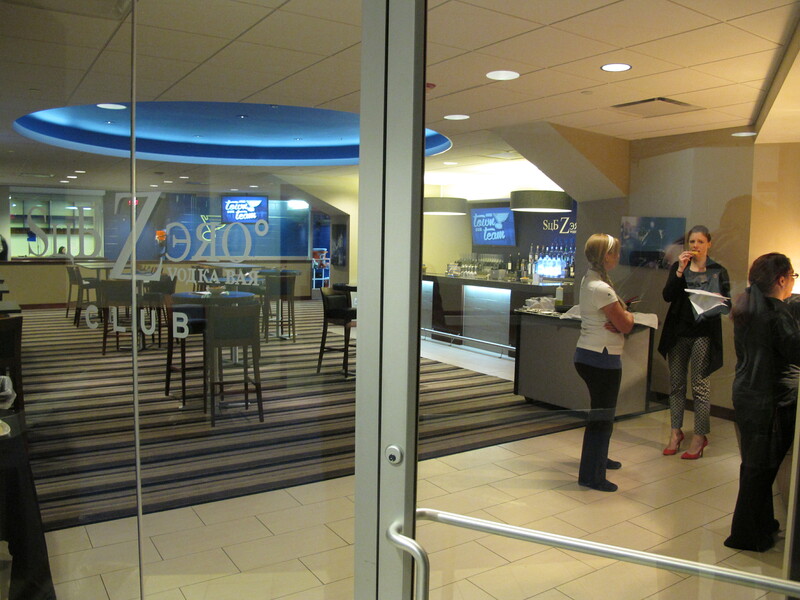 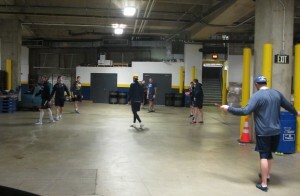 The Blues play their games in Scottrade Center, a building which is about 20 years old, but it doesn’t seem that old. 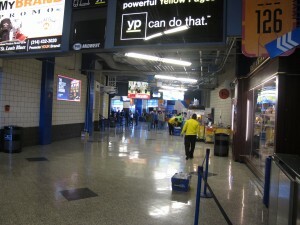 It has the same feel as any of the more modern arenas I’ve visited. 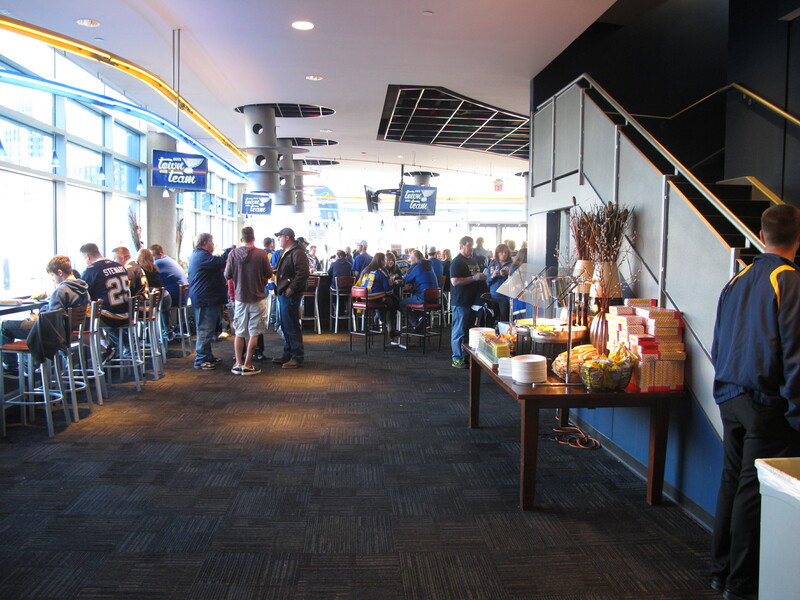 Lots of elbow space, lots of natural light, great food and eating, and lots of seats to watch a hockey game – over 20,000 capacity counting standing room! I exceeded my budget a bit for this game, purchasing a ticket for $178.00 in the lower bowl, which gave me access to their club lounge on the main level. 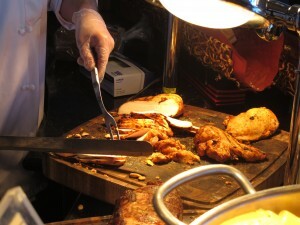 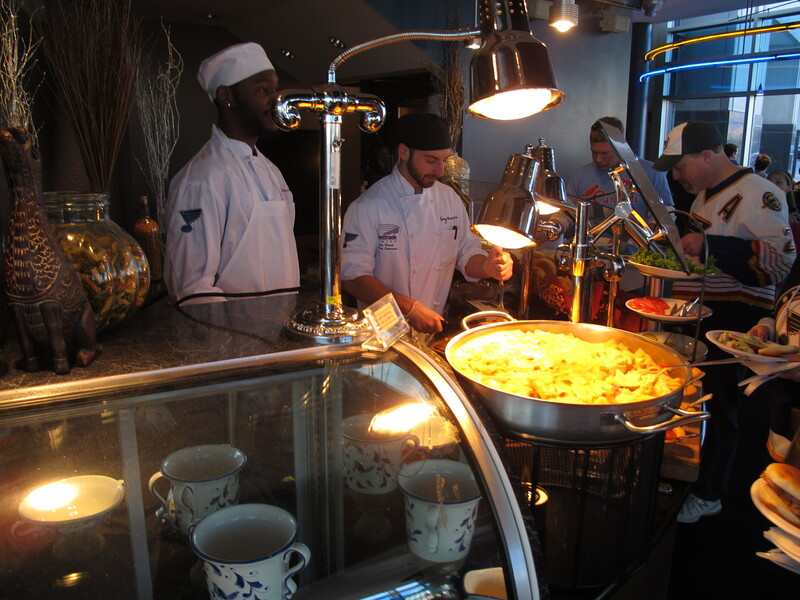 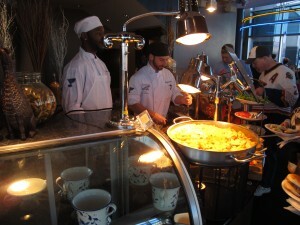 The ticket price included complimentary food (buffet) and drinks – a pretty good deal! 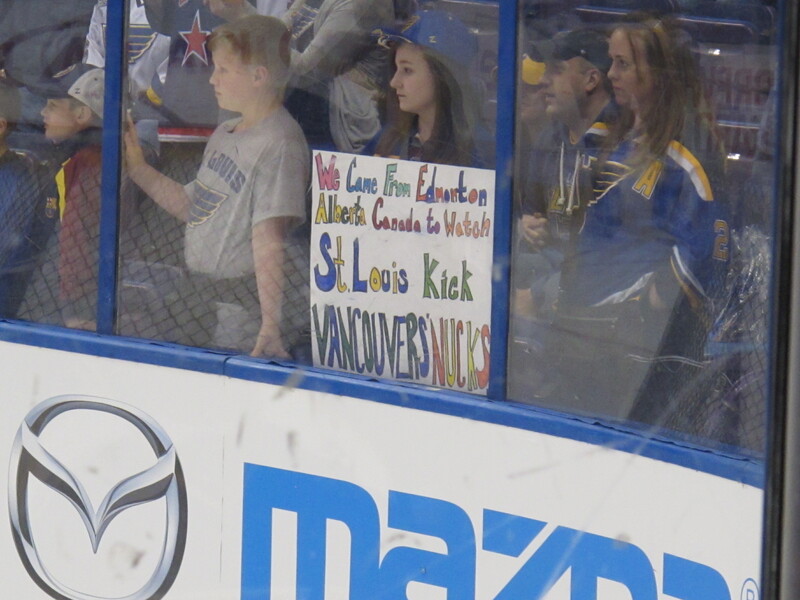 At the pregame skate, I noticed someone from my hometown (Edmonton) holding a sign up behind the home team net. I made my way over to introduce myself to mom (Danielle) and daughter (Renee) both who already knew about my 30games-30nights hockey trip. 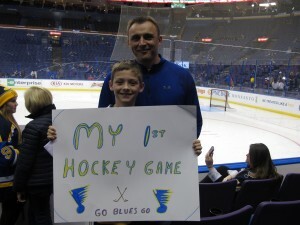 Here’s a pic of another young fan with a hockey sign – Connor who was attending his first NHL game. When I said that it was my first NHL game too, he didn’t believe me! 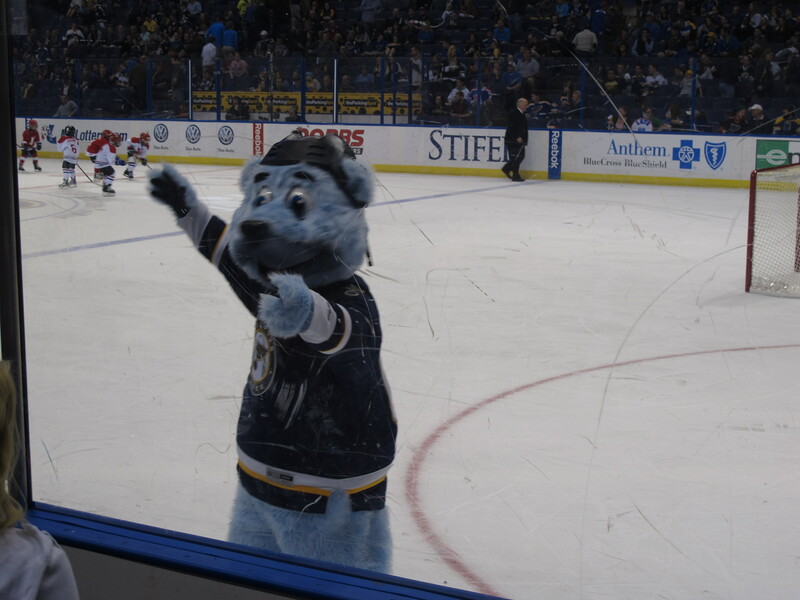 I’ve also added a picture of the St. Louis Blues mascot (Louie) – he’s probably the tallest mascot I’ve seen on my tour so far. Another mainstay in every arena is the 50/50 draw, where fans can purchase tickets, with 50% of the money going to the winner, and 50% of the money going to a local charity. 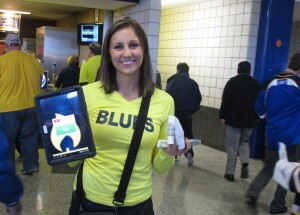 The ticket sellers are volunteers, and here’s Maddie who sold me my ticket. 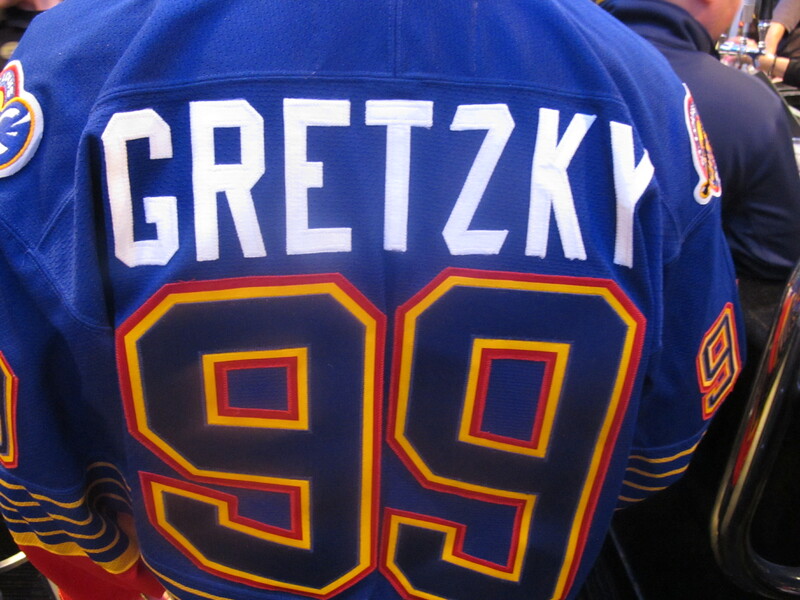 I also ran into a Wayne Gretzky fan, who remembers the brief time Gretzky played in St. Louis, so Gretzky could play with his buddy Brett Hull. 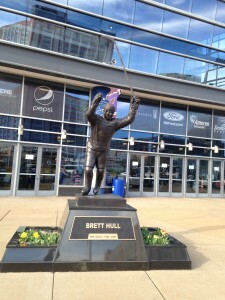 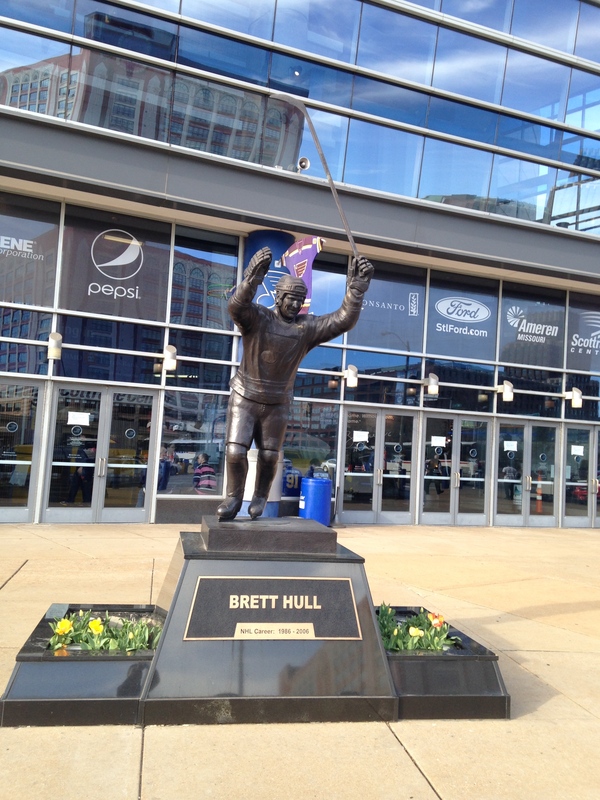 Hull is one of three players with statues in front of the arena, joining Al MacInnis and Bernie Federko. The Blues also have a “trophy case” featuring jerseys, sticks, etc. 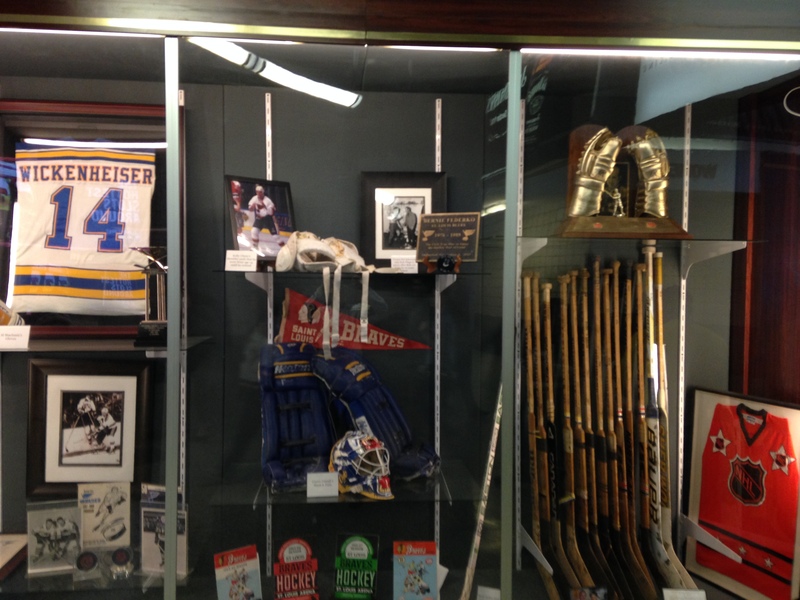 worn or used by players from the past eras. 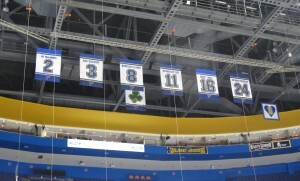 In finishing up my “report,” I’ve included a few mainstays of each arena visit, a photo of the retired (or honored) jerseys in the rafters, and a shot of the Jumbotron. 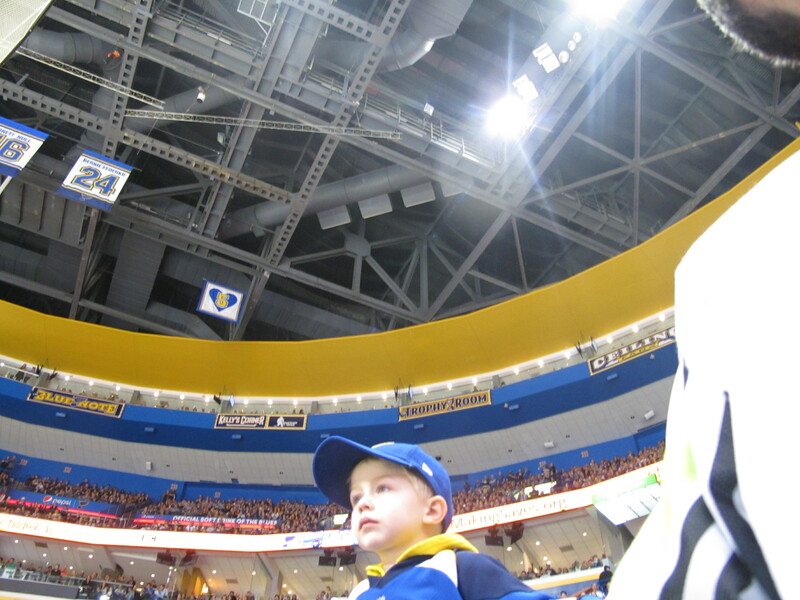 And lastly, I’ve included a pic of a young hockey fan. 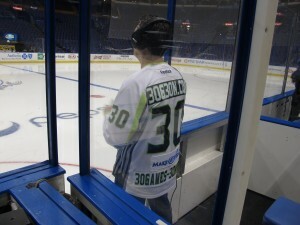 Maybe he will see 30 games in 30 nights some day! 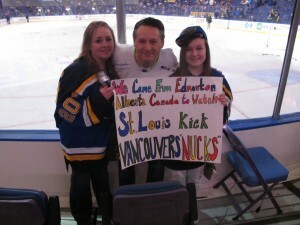 Once again, love all the pictures! 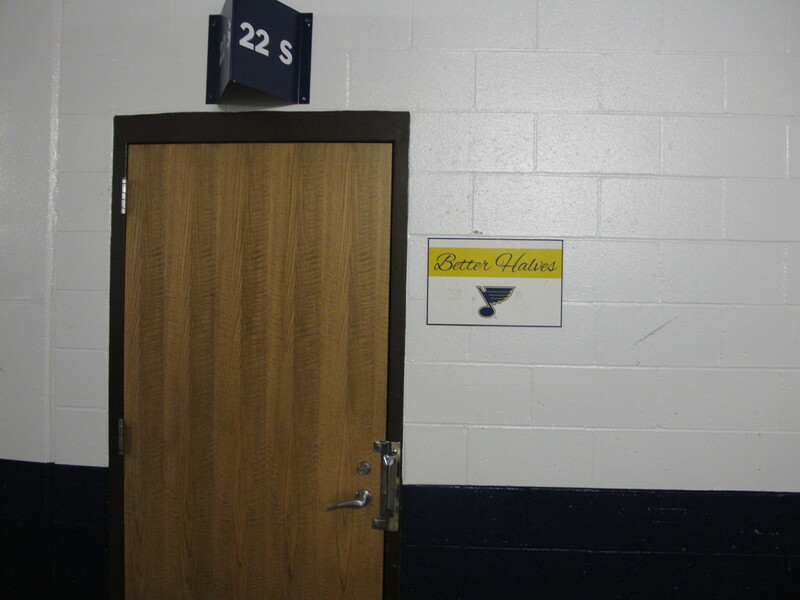 I really like that this arena has a trophy case – what a cool idea!